So yeah the other day, around Halloween, my wife and I went to this FLAMAZING sushi restaurant and just had a wonderfully unrushed time of fun and sushi-enjoying. She brought her sketchpad along and at some point in the evening we were talking about her pets she had as a child. She did some really quick, wispy sketches of some doggy dog, and then I good-naturedly added some embellishments to the drawing. 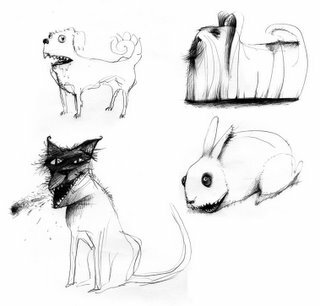 Then she did another dog she had, and then a cat, and then a bunny. And the madness continued. 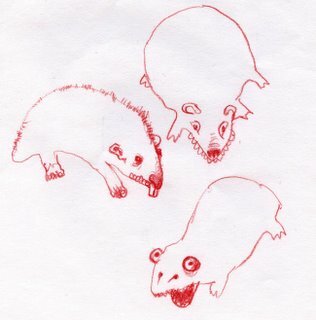 A few weeks later, Annie drew her [childhood] hamsters for me. Golly! Marriage really IS fun! These are fantastic! Gold Stars for you both!